Two runners for the stable on Wednesday when Bianco Nuovo and Rue de Rennes head to Mornington for the twilight meeting. Rue de Rennes is the first to go in race one, The Big Screen Company Maiden Plate over 2030m, with Patrick Moloney to ride from barrier one. 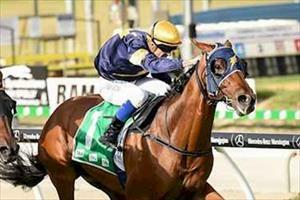 It will be the third run this preparation for the daughter of Cape Blanco, which finished fourth at her last start over 1700m at Geelong. Mike Moroney feels the step up in trip will suit Rue de Rennes. "Her work leading into this run has been first rate and she has improved from her excellent run last start,” Moroney said. Bianco Nuovo (pictured) is in race seven, the Ladbrokes Odds Boost Handicap over 2030m with Jason Benbow to ride from barrier five and the field reduced to eight rivals following scratchings. Bianco Nuovo won his last start over 1500m at Cranbourne and has pleased Moroney since. “He has worked much better this week and we’re happy to run him,” Moroney said. “He steps up to 2000m which I feels will suit and he has drawn to get the right run.